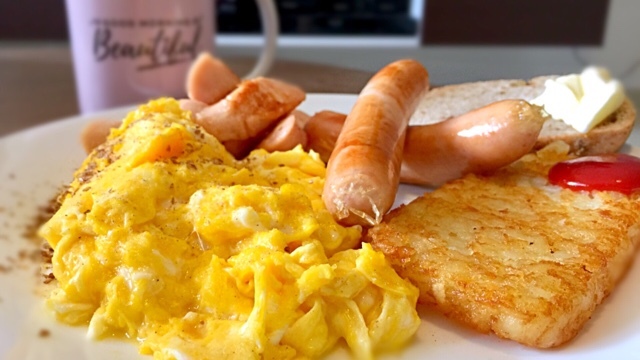 How to cook creamy scrambled eggs? Wondering how restaurants achieve those creamy and soft scramble eggs? I am a fan of Masterchef show and during one of the episodes, the chef explained the secret behind it. The secret lies in the heat of the pan you are using. Creamy scrambled eggs have to be prepared over very low heat. To prepare the eggs, I cracked the eggs into a bowl, added a small amount of pasteurised fresh milk to give the scrambled eggs a smooth texture. I also added salt for flavouring. I then put aside my eggs mixture and prepared other ingredients first so that the oil used for my eggs would have the fragrance of the sausages and hash browns. I switched off the stove and let the pan cool down. I poured in the beaten eggs and scrambled the eggs, making circular motions. The eggs would start to cook as the pan was already hot. I would switch on the stove again and ensured that the eggs were cooked over extremely low heat. Depending on the shape you like, if you prefer Mac style, you can push the eggs to one side and let it form a shape before scooping it onto the serving plate. Recently, I also discovered that Fairprice Cheese Sausages are very finger-licking good. I boiled the sausages lightly before frying to soften the outer "skin' used for wrapping the meat. Next, I would fry them on a frying pan until golden brown. For hashbrowns, I always go for Farmland Hashbrowns. I also purchased Walnut Country Loaf from NTUC - it is really healthier and delicious. I also enjoy using Spreadable butter from Lurpak. Lurpak butter is so smooth that it reminds me of ice cream. I always used olive oil suitable for stir-frying and if you look at the picture again, are you wondering what's the brown stuff sprinkled onto the eggs? They are premium ground flaxseeds known for their health benefits such as Omega 3 and ensuring healthy hair and skin. They complement the eggs well and can go with cereals too.